No eloquence could have been so withering to one’s belief in mankind as his final burst of sincerety. He struggled with himself too. I saw it – I heard it. I saw the inconceivable mystery of a soul that knew no restraint, no faith, and no fear, yet struggling blindly with itself.- Joseph Conrad, Heart of Darkness. The Wikipedia page for The Heart of Darkness notes that the novella was criticized for being racist. Having read the book, I cannot say for sure why this should be so. This is made difficult because HoD is a story-within-a-story. Thus, when African natives laboring in the ivory trade are referred to by the derogatory term “niggers”, it is a term used not directly by Conrad but by Marlow, the narrator of the story. On most ocassions, Marlow’s reaction to the suffering of the natives is one of mild irritation and disdain. From this, one could make the case that Marlow was racist. This is still difficult to accept. It is much easier to accept that Marlow – and all the characters in the book – belong to the colonial period, which, apart from the trade-related expansions, was characterized by the white colonizer’s superiority over his coloured subjects. Thus Marlow is about as guilty as the rest of the colonizers. To say that Conrad is a “bloody racist” would need much stronger justification and I would like to read further about why Chinua Achebe made just such a claim. I could guess at the reasons though, based on my reading. Marlow explains at one point in the book that the white officers sent to manage the stations of the ivory trade usually did not hold up very well. In the story, one realizes that, even with steamers to navigate the upper reaches of the river, even with all the innovations that the colonizers can muster, they have no answer to the pervasive darkness of the African continent. Whether Conrad meant the darkness to signify the unknown, or to suggest that the continent was – by nature – impervious to civilisation, is unclear. The latter suggestion, if Conrad indeed meant it that way, can be used, to legitimately fire the “racist” accusation at him. But Achebe, according to the Wikipedia note, seems to have objected to the dehumanization of the African people in the book. This, I think, is not reason enough to label the book as racist, considering that the atrocities and the subhuman treatment of natives really happened. The unremitting gloom of HoD derives from Conrad’s own experiences in the Belgian Congo, from which he returned in 1894, phycially and mentally ill. But it is not a book about racism, or colonialism, these being characteristics of the period in which Marlow’s story is based. It is, essentially, a book about greed and corruption of the individual. The passionate Mr. Kurtz has become famous throughout the trading company for his growing power among the ivory traders. His greed and his power have grown in concert till he commands a small fiefdom in the wild. Kurtz is portrayed as a brilliant man who comes face to face with his potential for cruelty – and yields to it, becoming uncivilized and wild in his passion for power, mirroring the untamed forest that he lords over. The book is an indictment against the lack of restraint, as evidenced by the human heads that stand on the fence posts outside Kurtz’s station. What I liked about it is that, in spite of the grim tone, it reminds the reader repeatedly that Kurtz was a “remarkable” specimen. Conrad warns that people who are talented and passionate – remarkable in some way – ought to guard against the excesses of their imagination. This message, conveyed stridently through Marlow’s exasperated admiration for Kurtz, is probably the only thing with some clarity in the otherwise murky gloom that is the Heart of Darkness. I cannot claim to have liked the book, though it never became less than interesting – its nebulous prose does not induce any kind of reading urgency; its characters are not lovable, and the narrator seems at once eager to describe the situations and reluctant to explain them. Judging by the astonishing clarity of some few sentences though, one is tempted to think that Conrad wrote intentionally in this vague way – perhaps to connect it with the unknown gloom of the forest and the dark misguided passions of Mr. Kurtz. Heart of Darkness full text on PlanetPDF. 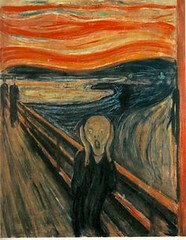 Above, The Scream seemed apt for this post, as a representation of Marlow, who looked into Kurtz’s soul, or of Kurtz who understood his own depravity. Hmm, I’ve never read any Conrad and am still not inclined to do so. I think I would have to read it for a purpose, rather than for pleasure. “Purpose rather than pleasure” is quite an apt way of describing it, litlove. Now, I’m ready for something that is light and enjoyable. Too many dark books over the past few weeks. Light and enjoyable seems like a fine idea. I have Mark Helprin’s Freddy and Fredericka going, and like it well enough. He’s a fine writer and it’s a good story, which surprises me because I don’t have the least interest in “what really happened” between Charles and Diana. Also, the new Pevear translation is turning into a big hit in our house, both as bedtime reading for my older boys and when I can get it away, lying around on the couch reading for me. translation of what, you might be asking yourself, reading that poorly edited comment above! Why, translation of the Three Musketeers, of course! Whether HoD should or should not be construed as racist is the subject of much discussion, but it is too long to go on about it here. Achebe’s reaction was not just to Conrad, however; it was a response to a tradition of what he strongly felt to be mis-representation of Africans by a number of colonial authors. If you’re interested, I recommend you read Home and Exile (in addition to Things Fall Apart), a book compiled from three lectures Achebe gave at Harvard which would elucidate Achebe’s reasons for condemning HoD as racist. Plus, it’s also a very interesting read in general! Max: Thanks very much for the reference. I will check this out. I am always looking for a good book and like your reviews. I hated Heart of Darkness when I read in it high school….to macho–like Hemmingway. But perhaps I should reconsider? I linked you….hope you don’t mind? Cole, I think H.o.D is hard to read; at any rate, it is hard to begin. Once Marlow (the narrator of the story) gets going with his story though, it is a treat. I loved his description of the steamboat’s journey into the heart of darkness, towards Mr. Kurtz. Thanks for the link. Of course, I don’t mind. Well, I read this book for school and I got a project to do. Just wondering. IS that picture a pic that was of any of the themes of this book? If it was anyone please confirm with the below email. Mani: No, the picture above was not part of any of the book’s themes. I just felt that there was some equivalence between what Munch felt when he conceived of the picture and what Marlow felt when he was descending into the Heart of Darkness. One more thing: To protect yourself from spam, please don’t leave your email address inside the body of the comment. Mentioning it in the form field before the comment should be sufficient.